New Year’s Eve is one of my favorite days of the year. I transfer important dates from my old calendar to my new one, giving me a mini review of all the dinners, appointments, visitors, workshops, and other activities from last year. I can remember why it was so hard to breathe in July and August when there were so many things to do and people to see that there was no room to add more more without covering up the day’s tide chart. I look back at the good times and the bad. I take some time to remember the people who are no longer with us and think of something about them that makes me smile. I love seeing the news programs with their flashbacks. Like looking at last year’s calendar, the images compressed into 3 minutes of air time, is a memory vitamin. 1. I will make many, many of my own clasps for necklaces and bracelets, so I can abandon my habit of using commercial clasps on pieces that are otherwise all my own design. I have been reading these books a lot in the last few days. So inspiring. 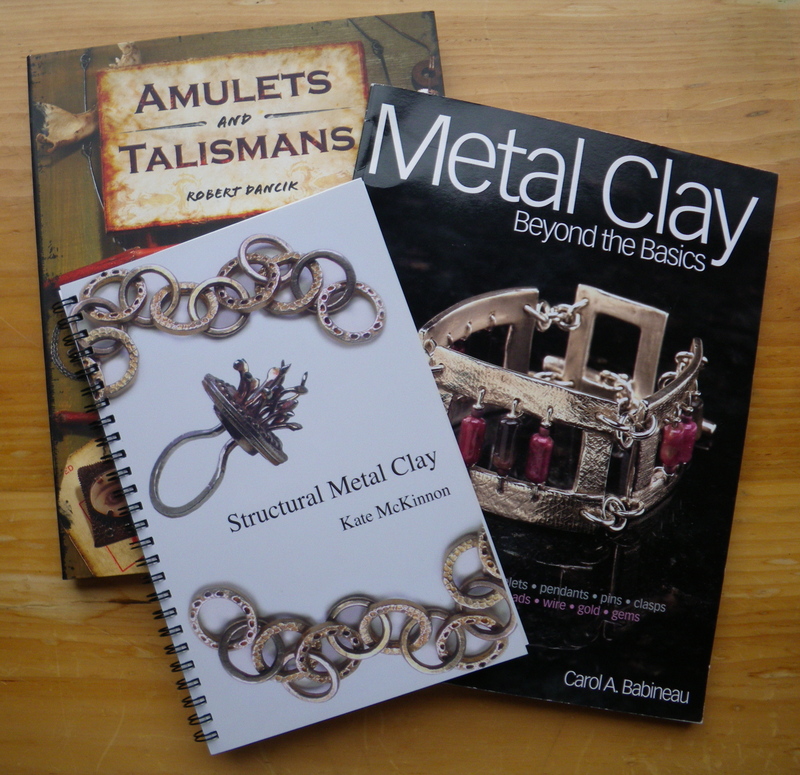 Especially the Kate McKinnon book which has changed the way I look at working with metal clay. When I clean my studio this weekend for a fresh 2010 start, I will make my metal clay area so much cleaner than it has been in the past, stop relying quite so much on sanding before firing, and I’ll wear a mask when I fire something with a torch. Now that I’ve learned to wait for results, from the longer firing times for bronze and copper clay, I’ll have no trouble waiting while firing my silver clay for 2 hours at 1650º, going for maximum density and strength. And, I’ll be fusing those fine silver jumprings. 2. Speaking of bronze and copper clay, I have so much more to try and to learn. I will be guided by the excellent books and generous blogs of Hadar Jacobson. (And by everyone else who so readily shares their metal clay experiences.) 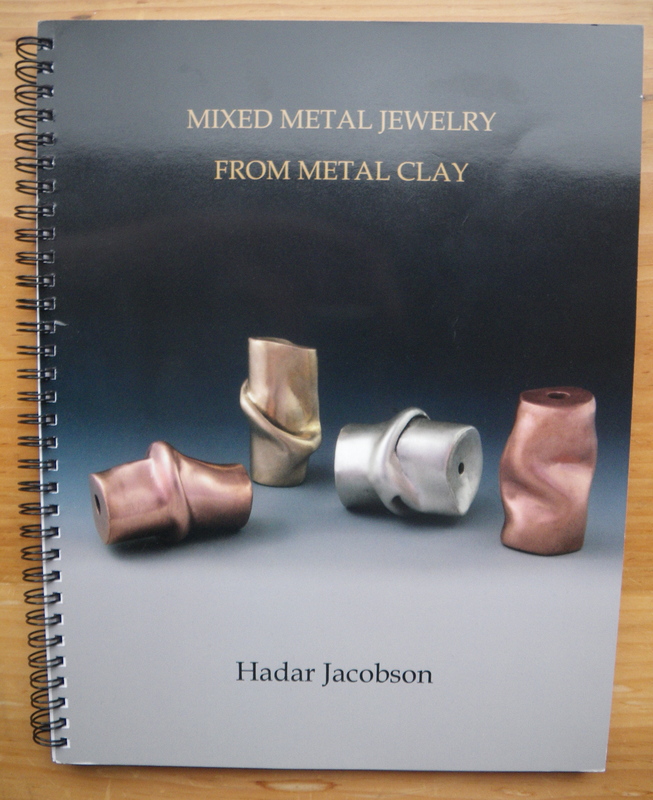 Hadar’s newest book is amazing. 3. I will take the time to photograph and write descriptions of my work so that I finally have my Etsy shop up and running. This is my only resolution with a deadline: A shopping link from this Website/blog by the end of January. Definitely. No excuses. 4. More writing. Maybe something on a daily basis so that it’s not so hard to come up with a column every month for the Working Waterfront. And more poetry. Just for the fun of it. 5. Follow up on the oil painting workshop I took from Henry Isaacs and Ashley Bryan in September. Color is calling to me via painting and polymer clay. 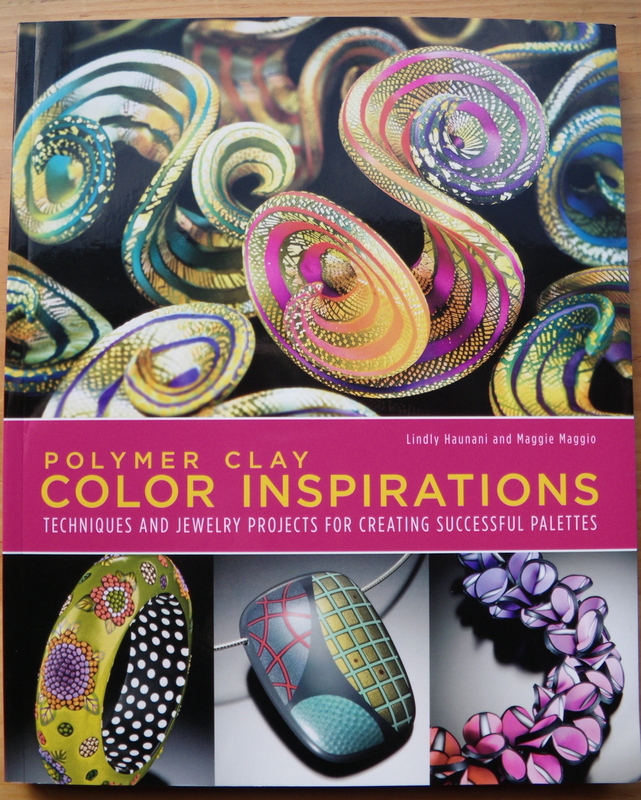 On a whim, I ordered this book by Linda Huanani and Maggie Maggio to inspire me to get back to some polymer clay ideas. Holy cow! I did not know how much I did not know about understanding the three properties of color: hue, value, and saturation. This book is filled with exercises in blending colors of polymer clay. I stayed up very late last night looking through it for the first time. 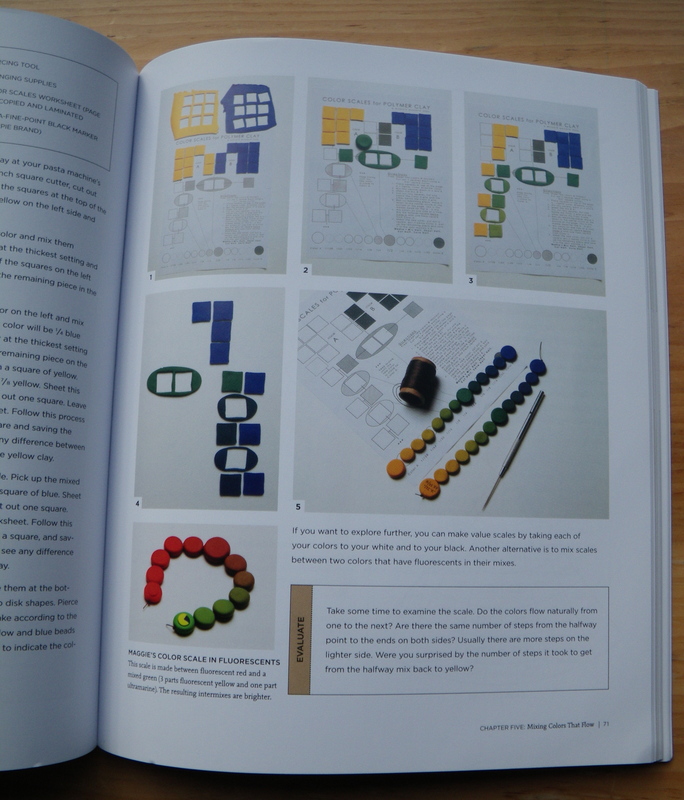 If I started at the beginning and worked my way through all the exercises in the book, I would have a wonderful source of color information that would apply to both polymer clay and oil painting. Just the “pivot tile” exercise alone would teach me a lot about color. 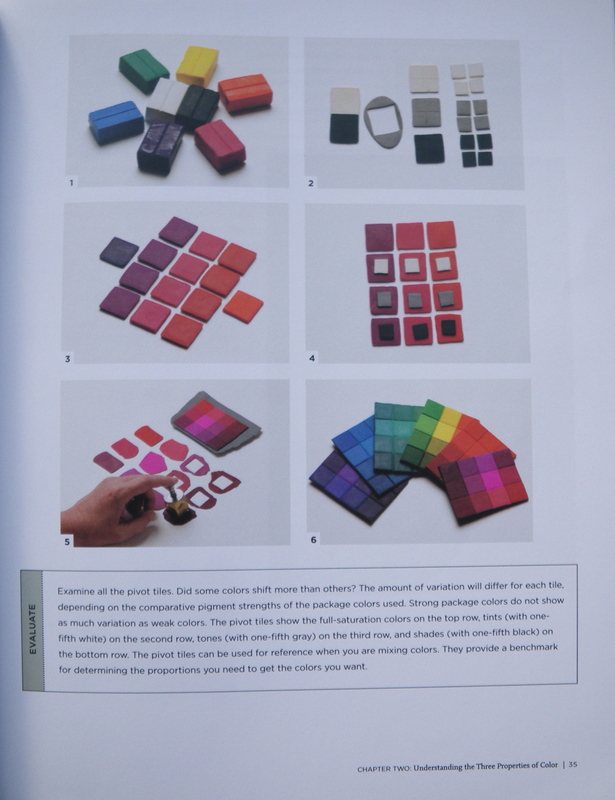 By taking one color of polymer clay from the package, then mixing it with a warmer color and a cooler color to get hue variations; then taking those three hue variations and tinting them each with white and black to get value variations; and then muting each of the three hue variations with gray to get saturation variations, you make a pivot tile. The ratios are all described in detail in the book. I can try a similar exercise with oil paint. Mixing color scales to have a sample of color flow is another enticing exercise. From start to finish, my course in color could take a long time, but what a resource to have! There is definitely no deadline to this New Year’s resolution. Thanks Barbara for some truly original and creative resolutions. The books look inspiring. I hope you do paint some more too..I thought the painting you did for the workshop was wonderful. Maybe I’ll resolve to paint again too. I’ve been thinking about it for quite a while. Time to do something!! More time to paint now that we’re not writing the weekly Islander column!! That would be resolution #6. How could I have forgotten to mention it!! I didn’t add a resolution for rearranging my studio and doing a major clean out-overhaul, but I started it today. Great hopes to finish in one day. Maybe in two days. I’d like a cleaner PMC area now that I’ve read Kate’s book. Happy new Year my friend!